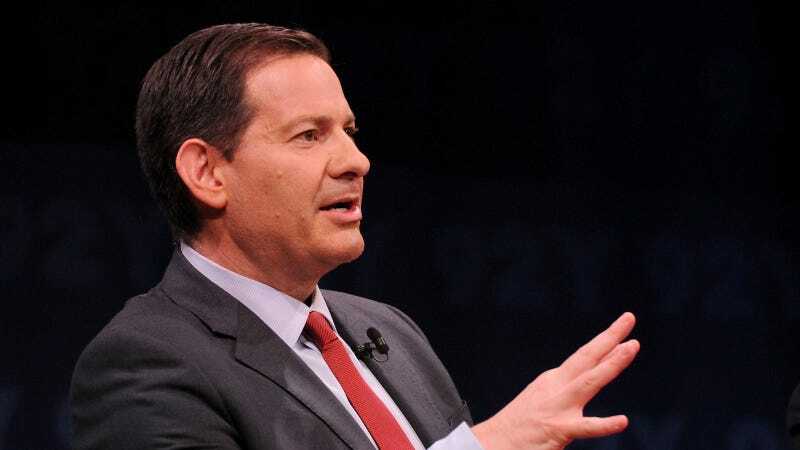 Three more women have come forward with sexual harassment allegations against political journalist, commentator, and Game Change author Mark Halperin, totaling the current number of accusers to eight. “I did not report Halperin to ABC because I thought I was the only one, and I blamed myself, and I was embarrassed and I was scared of him,” she continued. I don’t quite remember what we talked about, but I do remember him asking me to sit down next to him on the couch. I thought it was awkward to sit on the couch when I was perfectly comfortable sitting in the chair across from his desk. But I complied, and I also remember him sitting a little too close to me. At one point I felt a bit too uncomfortable, and I stood up to thank him for the meeting. That’s when he leaned in, tried to kiss me, and attempted to do a bit more. I didn’t want to offend the man in charge of political programming at ABC News, and I tried to be courteous and apologetic, and practically ran out of the office. I was upset not by his actions, but the thought that I did something wrong to encourage that behavior. Was my suit too revealing? Did I lead him on? Was this what I had to expect if I went into broadcast news or journalism? If so, I didn’t want any part of it. Luckily, I was resilient back then and I didn’t let this situation detour my hopes and dreams. I moved to Washington, DC and studied journalism full-time. When I finally landed a position at CNN on “Larry King Live,” I booked celebrities, politicians, and all sorts of newsmakers. One person I vowed never to book on the show was Mark Halperin. If that was my only payback, then so be it. Networks have responded swiftly, with HBO and MSNBC announcing on Thursday that they are cutting ties with Halperin. HBO will no longer pursue its project based on the book by Halperin and John Heilemann about 2016 Presidential election. “HBO has no tolerance for sexual harassment within the company or its productions,” the network said through a spokesperson. NBC suspended Halperin on Thursday and MSNBC will no longer invite Halperin on as a contributor. “We find the story and the allegations very troubling. Mark Halperin is leaving his role as a contributor until the questions around his past conduct are fully understood,” said an MSNBC spokesperson. Morning Joe co-host Mika Brzezinski agreed with NBC’s decision. “I will speak for both Joe and myself here: Our hearts break for both Mark and his family, because he is our friend,” she said, addressing the allegations on the program. “But we fully support NBC’s decision here. “We want to know more about these disturbing allegations. We want to hear the stories. We need to know what happened. And we’re not going to avoid the story just because he’s our friend…we’re going to cover it and we’re going to pray for everybody involved,” she said. Jezebel has reached out to Halperin for comment on the new allegations and will update if we hear back.